Within the tumor bulk, the more undifferentiated cancer cells can fluctuate between different states due to their plasticity, which has been reported as a peculiarity of CSCs, together with tumorigenic potential and self-renewal . Initially, CSCs were isolated and characterized in acute leukemia [19, 20] and then they were identified in many other cancers . The interest of the scientific community in this cellular population originates from growing evidence that supports its involvement in crucial steps of tumor progression, including tumor initiation and growth, metastases formation, drug resistance and relapse, being responsible for minimal residual disease (MRD). Cancer stemness and mesenchymal phenotype have recently been demonstrated to strongly correlate. Indeed, it has been observed that cancer cells that acquire EMT traits gain CSC-like properties, and CSCs often undergo EMT in order to generate metastases [22, 23, 24]. In fact, the EMT process can be crucial during the dissemination step that precedes metastatic colonization . However, the transition between an epithelial- to a mesenchymal-like phenotype is not a sharp switch, but rather occurs through different steps, thus defining a gradient of metastable phenotypes, where specific mesenchymal and epithelial features coexist and eventually lead to the acquisition of a stable EMT programme . During the first stage, characterized by a continuous source of stimuli driving the acquisition of the mesenchymal state, we observe the activation of specific pathways driving the EMT, which can be reverted once the TME stimuli cease. Differently, gaining a stable EMT phenotype includes a gene expression reprogramming, which involves the activity of specific transcription factors, non-coding RNAs or epigenetic changes, and it often occurs as a result of prolonged exposure to stimuli driving EMT . It is clear that CAFs can regulate EMT in cancer cells, however the underlying mechanisms are not completely understood. 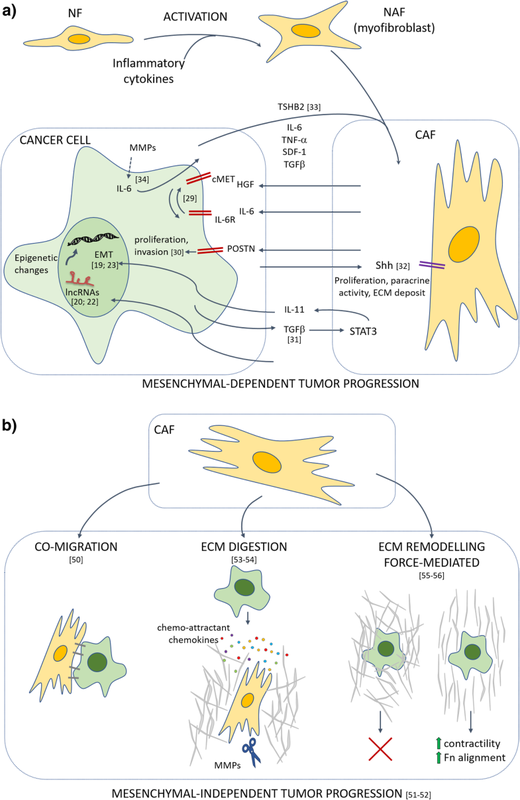 Here, we summarize the most recent findings regarding the crosstalk that defines the cooperation between CAFs and cancer cells in different phases of tumor progression. Such interplay can occur through different mechanisms, including CAFs’ altered secretome, which consists of growth factors and cytokines directly involved in the positive regulation of cancer cell survival, proliferation, stemness, and resistance to therapy. Moreover, by releasing cytokines and matrix metalloproteinases (MMPs), CAFs enhance tumor angiogenesis, local inflammation and extra-cellular matrix (ECM) stiffness. As already discussed, the complexity of cancer does not rely merely on intrinsic features of tumor cells. Rather, the interconnections between transformed cells and different components of the tumor microenvironment exert a pivotal role in cancer onset, homeostasis, spread and response to insults such as nutrient/oxygen deprivation or therapeutic drugs. Recent studies have reported an increase of the stromal compartment in colorectal and breast cancer of chemo-treated patients [11, 82]. This phenomenon has been recapitulated in mouse models where resistant tumor xenografts display a larger stromal compartment . These observations imply a putative role of the TME in promoting the adaptive response to therapeutic pressure. Indeed, chemotherapy-induced activation of the stromal compartment supports the survival of residual cancer cells by fostering pro-survival pathways, stemness traits and/or metabolic reprogramming and partially accounts for tumor resistance and recurrence . Specifically, sustained NF-kB activation in CAFs exerts a crucial role in orchestrating the molecular mechanisms underlying their tumor-supportive function upon therapeutic insults, through the release of paracrine signals such as cytokines, exosomes and metabolites [11, 84, 85, 86]. Unraveling the crosstalk of cancer cells with TME is therefore compulsive in order to identify novel therapeutic approaches and to overcome resistance to the existing regimens. Notably, non-transformed components of the tumor are genomically more stable than transformed cells, entailing a more durable response to drugs and candidating tumor stroma as an appealing therapeutic target. Besides the secretion of soluble factors, the release of exosomal vesicles is crucial to vehicle paracrine signals that drive cancer cell aggressiveness and therapy resistance. Exosomes are membrane vesicles of 30–100 nm in diameter that contain proteins, DNA, mRNAs and miRNAs. Secreted exosomes are uptaken by neighboring cells via endocytosis and vesicle content is released into the cytoplasm of recipient cells. Exosome-delivered RNAs have been described as pivotal mediators of tumor progression and resistance and powerful biomarkers [97, 98, 99]. More recently, the role of exosome transfer in TME-orchestrated resistance has been highlighted. In PDAC, treatment with gemcitabine stimulates in resistant CAFs the secretion of exosomes that deliver SNAIL mRNA and its transcriptional target miR-146, thus conferring resistance to recipient cancer cells . In ovarian cancer, miR-21 transfer from CAFs and Cancer Associated Adipocytes (CAAs) to cancer cells, stimulates cell motility and inhibits apoptosis thus enhancing chemoresistance, through its direct target apoptotic protease activating factor-1 (APAF1) . Further, a mouse model of hormonal therapy resistance in luminal breast cancer has been exploited to elucidate the role of CAF-derived exosomes. 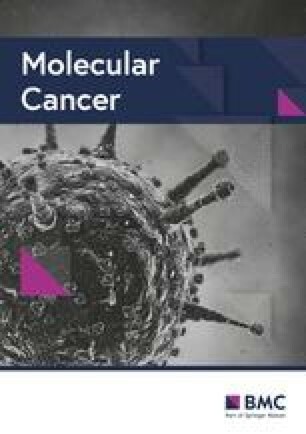 Autocrine IL-6/STAT3 signaling fuels CAFs proliferation and stimulates the horizontal transfer of miR-221/222high microvescicles to cancer cells. The uptake of miR-221/222 determines the induction of Notch-mediated CD133high phenotype, which is responsible for resistance. IL-6 targeting abrogates this circuitry, hence blocking resistance to hormone therapy (HT). This mechanism is recapitulated also in CAFs derived from patients’ bone metastases . Interestingly, in breast cancer the release of exosomes by stromal components determines the transfer of many non-coding RNAs (ncRNAs) and transposable elements to cancer cells, which activate STAT1-mediated antiviral response. Moreover, juxtacrine signaling of neighboring stromal cells induces the activation of the NOTCH3 pathway that converges into the STAT1 activation. These responses are able to select cancer cell subpopulations, enriching for tumor-initiating cells resistant to therapies . Tumor cells mainly rely on glutamine and glucose as energy sources and hijack CAF metabolism in order to meet their metabolic needs. Metabolic coupling between tumor cells and CAFs has been described as a mechanism of mutual adaptation to low nutrients availability that could be harnessed for novel therapeutic approaches [104, 105, 106]. Here, we will focus on the implications of such complementary metabolic reprogramming for the outcome of existing therapeutic strategies. Multidrug resistance can be triggered in cancer cells by the exchange of metabolites with surrounding CAFs that act as signal molecules inducing specific programs as differentiation or metabolic switches. For instance in prostate cancer, increased glutamine synthesis following macropinocytosis of extracellular fluid has been detected in primary CAFs and correlates with constitutive activation of Ras signaling . In turn, CAF-secreted glutamine fuels prostate cancer mitochondrial metabolism and induces neuroendocrine differentiation, orchestrating an adaptive response to androgen signaling deprivation therapy (ADT). Consistently, greater blood glutamine levels have been detected in prostate cancer patients who progressed on ADT compared to responders. Notably, counteracting the uptake of stromal glutamine restores sensitivity to ADT in a castration-resistant xenograft model. CAFs are major players in driving onset and progression of solid tumors by affecting cancer cells’ plasticity, invasion and colonization ability, and therapeutic response. Their diverse tumor-supportive roles, combined with genetic stability and relative abundance among stromal cells, make these tumor cells’ henchmen an appealing therapeutic target. 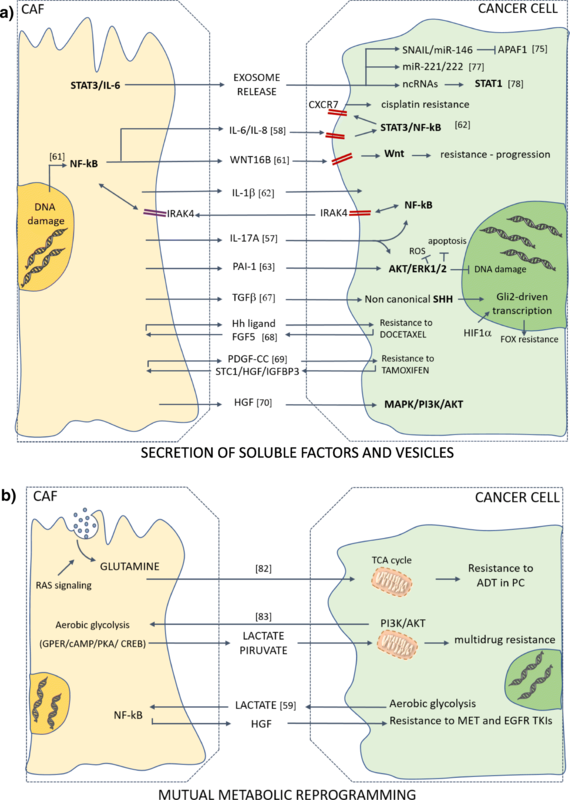 Here, we will briefly highlight the major advances and challenges in the development of CAF-directed anti-cancer therapies, although we recommend the recent review by Chen and Song for a more extensive dissertation on this topic . Several anti-cancer strategies aiming at depleting the CAF population have been developed so far, ranging from metronomic chemotherapy to immune-based therapies. The traditional maximum-tolerated dose chemotherapy regimen has been reported to induce CAF secretion of chemokines that endow tumor cells with CSC traits, ultimately fostering chemoresistance. In contrast, metronomic chemotherapy, which consists in administering low doses of drug on a more frequent or continuous schedule, prevents CAF paracrine signaling and results in enhanced treatment response . Moreover, DNA vaccines targeting FAP have succeeded in boosting CD8+ T cell-mediated killing of CAFs in pre-clinical studies. Remarkably, combining FAP vaccination with chemotherapy yielded up to 70% greater uptake of chemotherapeutic drugs in tumor xenografts . More recently, co-administration of a novel FAP immunogen with tumor antigen-specific DNA vaccines synergistically enhanced antitumor immunity in mouse models of lung and prostate cancer . As an alternative immune-based targeting strategy, adoptive transfer of FAP-specific chimeric antigen receptor (CAR) T cells proved to be effective in restraining tumor growth in pre-clinical models of lung, mesothelioma and pancreatic cancer [112, 113, 114]. However, the feasibility of the aforementioned approaches has been challenged by the finding that FAP+ cells reside in almost all tissues of the adult mouse and exert a pivotal function in preserving tissue homeostasis in the skeletal muscle and in the bone marrow .